Office Watercoolers. Free 7 day Trial! With our free trial, you can use one of our bottled water coolers for 7 days for free, no hassle, no questions asked..it's as simple as that! Take full advantage of our introductory offer and decide whether our water coolers are right for you and your business / organisation without any obligation. We offer a free 7-day trial for all our floor standing and counter top bottled water dispensers. If you cancel your water cooler either within or at the end of the 7-day period, you will not be charged for anything, it's completely free. If you decide you would like to keep the cooler, then you don't need to do anything. Our Sales team will call you at the end of your 7-day free trial period and discuss the best payment option for your requirements moving forward. Am I entitled to a 7-day free trial if I upgrade from an existing bottled water cooler or if I've taken part in a free trial before? 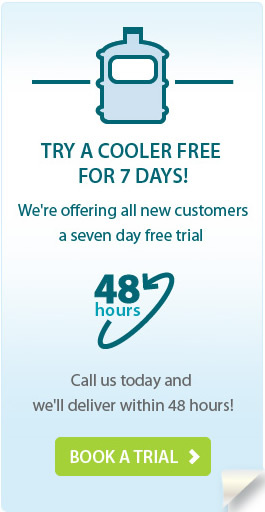 If you upgrade your cooler or you have taken part in our free trial introductory offer before, you are not eligible for the 7-day free trial. This only applies when you sign up for a new account. Can I have a 7-day free trial with a mains fed cooler or one of the other specialist dispenser products? Our 7-day free trial is only available on our bottled water cooler range. Can I trial a water cooler across multiple sites in my organisation? No, we offer a new account a 7-day free trial at a single location. If you decide to keep the dispenser at the end of the trial period and would like additional coolers for the same site or across various locations our sales team will be happy to organise this for you. Do I have to provide any credit card or payment details when signing up for the free trial? That's easy, you can call our sales team on 0845 609 0902 or complete the short enquiry form below and we'll call you back.